Author Patricia CulleyPosted on December 17, 2017 December 17, 2017 Categories Deep Thoughts, Family, Jeremy, Josiah, Judah, Life, ME, Mental Health, The Autistic Spectrum, WritingLeave a comment on Who will YOU see? Not even finished my first cup of coffee and hair and make up not done…..I raced out of the house and down the street to our dentists office. I walked in the door and they ushered me to a back room where I found this. Good Saturday morning to you too! Nothing like a spectacular dose of trauma to start the weekend. It’s dental work. My boys needed fillings. How simple is that? Go in, get it done….BAM! I sat in the recovery room with Siah and listened to Judah screaming through 2 closed doors. It’s hard to think straight when your world feels torn to shreds by trauma. When anxiety overwhelms to the point that nothing makes any sense. When trauma tells you that you are in terrifying danger. When you brain lies to you and it doesn’t matter because you can’t think beyond this exact moment of terror. Siah was curled in a ball, yelling and screaming at me for letting them hold him down. He was so upset that I couldn’t even touch him or comfort him. In the end, it’s more traumatizing for us because now that they have settled and the meds have worn off, they don’t even really remember what happened. Yay for the meds actually working. I say that as sarcastically as I can because I was called there…..without the benefit of mind numbing meds, to witness and experience it all. To be hit and kicked, in fear. To be rejected and not allowed to give comfort. As soon as he settled some, I traded off with Jon to go and see Judah, who was terrified, mostly because he heard Siah panicking. And being unable to see what was actually happening….he assumes the worse. Siah actually finished his dental work. Judah wouldn’t let them near him…..even cracked out on meds. We made it home eventually. We’ll have to cough up the insane costs to have Judah sedated to actually get the work done. Watching someone you love suffer from anxiety is brutal. Can I encourage you to have compassion for those you know who deal with mental health issues? I’m gonna get up tomorrow, put make up on and go and sing my heart out. You’d never know what I experienced today by just looking at me…..and I’m not looking for pity. Compassion and understanding though…..definitely. Especially when my boys are acting out and I have nothing left to give but I dig deep and create energy out of nothing. But my sharing is not just about me. Be kind and compassionate to those parents and kids you know who struggle…….you have no idea what they really are going through and I guarantee you they won’t share the reality. It would be too much to handle. It is too much to handle. Author Patricia CulleyPosted on May 31, 2017 May 31, 2017 Categories ADD/ADHD, Anxiety, Deep Thoughts, Jeremy, Josiah, Life, ME, Mental Health, School, The Autistic Spectrum, Writing3 Comments on Dear School System….. I posted a picture the other day…. We have an appointment on Wednesday to go and talk with someone at the School Board about this most recent incident with Jeremy. I haven’t overshared about this situation for a number of reasons. I’m utterly exhausted and traumatized by it all. It requires immense energy to barely hold together a sweet boy who has been traumatized by it all. I alternate between anger, apathy and anguish on an hourly basis. It’s almost surreal to me except that it altogether , too real. This is a culmination of years of educationally based trauma for Jeremy and us. My brain keeps hurling words, thoughts and feelings at me and this is my attempt to capture some of those words and make sense of them all so that we can share consisely on Wednesday. At the very Center of all of this is Jeremy. My sweet boy. He struggles immensely as a young boy and that was the one thing that he ALWAYS had going for him. He was SO sweet and charming. Couldn’t focus if his life depended on it. Couldn’t read or write. Couldn’t decode social situations…..but he was absolutely darling. That was probably his biggest saving grace. For all of his struggles, Jeremy has been desperate to connect…..desperate for relationship. He hasn’t been very good at it and when he was finally diagnosed at 13 years old, during his second attempt at an assessment, with Autism…..so many things made sense. I find it interesting and so very incredibly frustrating that the older he gets, the less patience, support and care, people seem willing to offer. It’s like they expect him to have “gotten” it (whatever “it” is) and are more likely to judge that he’s just not trying hard enough. That’s a HUGE load to be carrying…..and he’s been carrying it for 16 years. Its an incredible testament to his resiliency that he keeps trying every day. That he gets up and in spite of his worries, in spite of inaccurate and hurtful judgments, in spite of constant internal and external pressures…he gets dressed, packs his bag, says “bye mom, I love you!” and heads off to school. On an aside, Jeremy has been looking for a job. He’s handed out a lot of resumes, but between a “special needs label” and a service dog….his job hunt hasn’t been very successful. We’ve heard SO many positive comments about how Polite and Courteous he is. How he is SO respectful and seems incredibly keen to work…..but nothing has translated to actual employment. This past week, in the middle of this chaos, Jeremy got a job. He got a job because someone gave him an opportunity to show them what he is capable of. The feedback we got, was that he is probably the hardest working person they’ve had. THAT……….THAT is who my son is. He IS hardworking. He IS responsible. He IS respectful. He is DESPERATE to please and to succeed. He WANTS to do his best……not just for you, but because working hard, being respectful, and doing your best are characteristics that we have consistently and tirelessly impressed upon him as critically important to his very being. Down to his very soul, to the core of who he is…….Jeremy is desperate for connection….for relationship. If you were to ask me what he wants most in this world…I would say that relationship trumps everything. If you were to ask me what he struggles the most with….I would also say relationships. This is where his disability comes into play…..
Would you get angry or frustrated if a person who was missing a limb couldn’t climb a ladder as fast or as nimbly as someone with complete functioning limbs? Would you be short tempered with someone who had a cleft palate or was in a wheelchair? Now I realize that every disability has people who are cruel/uncaring and judgmental…..but that’s not what I’m referencing here. How about someone who is blind…….but you didn’t realize they were blind? You may be frustrated that they weren’t as fast and nimble at everything but as soon as you realize they are “differently abled”……more often than not, we have an “AHA!” moment and our compassion increases. How often do we see a child having a temper tantrum in a public place and judge? How often do we hear that a child in our child’s classroom “freaked out” and they had to clear the room; and judge that that kid is spoiled and gets away with too much? Or is our first thought, “what perfect storm of physical/mental or emotional triggers overwhelmed him till all of his energy and ability to “hold himself together” was depleted? Do we judge the behaviours or see the behaviours as communication? It doesn’t matter who you read, Stuart Shanker, Ross Greene, Gordon Neufeld, Gabor Mate, Brene Brown or countless others……..CONNECTION is CRITICAL! We crave connection and acceptance on a very deep level. Disconnection and rejection have a HUGE impact on humankind. Without connection, we are more easily succumbed to addiction, depression, self harm, etc. It’s hard to find the strength to carry on when we are alone. But when we know that we have the love and acceptance of those who care for us……..amazing things happen. We can shine and grow. We can reach and exceed our expected potential. How many inspirational stories do you hear and read about where “someone believed in me so I believed in myself and accomplished great things? What’s at the core of those stories????? Connection. We are hard wired for connection. Will you look for moments to connect, this week? Especially with someone who is struggling to connect. Reframe “behaviours” from “a terrible child” to a struggling child and ask Why they are feeling and acting this way and what is instigating the behaviours. To see our children as struggling and not as defiant or problematic is the start of an incredible journey towards connection that will benefit you and I and the world.. This week has been a tough one. One of my boys has been discriminated against because of a lack of understanding of who he is, what his struggles are and what supports he needs. I’ve been trying to wrap my brain around what I’ve been feeling this week. This situation could have been avoided had there been more understanding, more inclusion, more compassion, more knowledge, and less selfishness. If people had taken the time, energy and effort to know my son…..to really know him……they would not have treated him the way that they did. If they had looked for and discovered his heart and soul….they would not have judged his struggles as defiance or disobedience. If they had looked for, and discovered his abilities….then his disabilities would have been overshadowed. If they had looked for and recognized his intense desire for relationship and connection…….they would have been able to see beyond the anxiety and disregulation. I keep coming back to this idea of “knowing” and of “being known”. I believe there is a desire in all of us to really, truly be known. Maybe that thought terrifies us….maybe it excite us….. I believe that our biggest fear in being truly seen and known, is the fear of being rejected……of not being accepted. That’s what we, all, want…isn’t it? 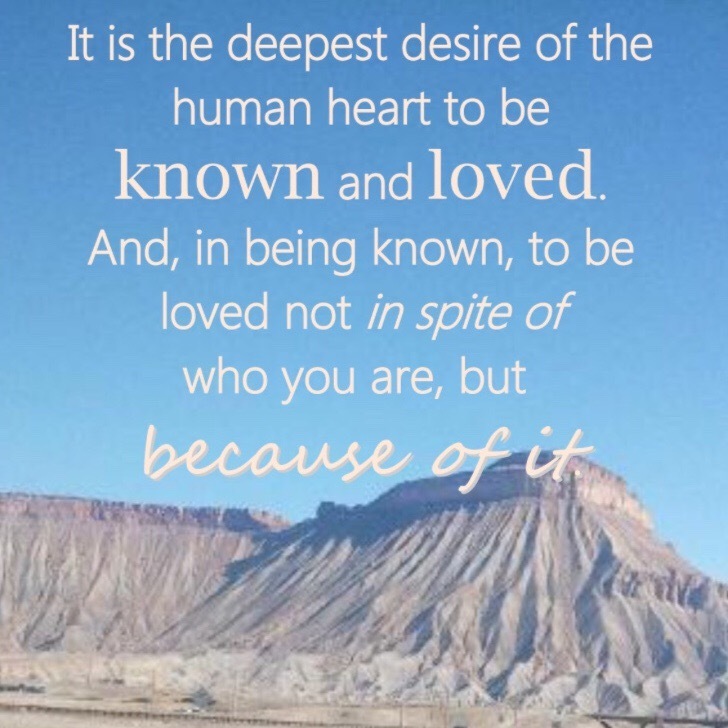 To be known and to be loved, exactly for who we are. I’m not saying that we should never grow or work on areas of weakness. Growth and Personal Healing are critical, but being loved and accepted for who you are is so important. I know that this is one of my deepest desires and yet, if I’m completely honest……I’m terrified that if you truly knew me, that you’d reject me. I don’t know why I think that. I don’t think I’m a bad person. I try to be authentic, open, and honest. If you only know me online, I believe that I’m the same person in real life. I can be funny. I can be serious. I try to live with compassion and not judge. I want to exemplify love in my words and my actions. I don’t shy away from the truth, nor do I want to hurt people with it. I share about the good and the bad. I speak with way too many exclamation marks and periods……..just like I type!!! I find it difficult to speak without my hands, without using facial expressions, and my whole body. I feel like I’m constantly diminishing my true self because my true self is overwhelming. I LONG for connection and yet, I’m terrified of it. And maybe this is why I feel SO strongly for my children…….I see their intense desire for connection. I see their yearning for relationship. I see their hunger to be known………and accepted……and cherished. And yet, they are big……their personalities can be larger than life. They can be overwhelming at times. But I SEE them……I KNOW THEM! And yet, they’ve been hurt….too many times! They’ve been hurt because people didn’t, couldn’t or wouldn’t look beyond the struggles and disabilities to see them…..to truly KNOW them. I believe that we miss out on some of the most precious treasures in the world, if we dismiss those who may be differently abled. Maybe in really, truly seeing and accepting others; we too, will be seen and accepted………..what would our world look like then? Can you imagine waking up in a remote village on an island somewhere? It’s a beautiful place filled with people very similar to yourself in looks. So, it’s not like you stand out as different. But there are differences…..you don’t really seem to speak the same language as everybody else and you don’t really understand the customs or the social rules of the community. You want to fit in. You want to make friends. You are so lonely but no one seems to understand or accept you in the same way that they understand and accept each other. You try really hard to communicate, but the harder you try to connect with the people, the more they seem to misunderstand you. They start to talk to each other, about you. Many of the attempts that you make, to connect and communicate, seem to highlight your differences and exacerbate misunderstandings. Over time, your anxiety about being able to connect grows, which only increases your difficulties in interacting. Eventually, over time, you learn a few phrases, and a few of the customs…..but it’s really not 100% clear to you; and more often than not, the people are confused and/or offended by your attempts at relationship. Even worse, sometimes they mock and ridicule you. Will you imagine if this was your reality for your entire life? Will you imagine how lonely you would feel? Will you imagine how desperate you would feel………. Can you imagine not understanding the social rules of the world? Can you imagine not being able to read body language or facial expressions? Can you imagine not understanding “inferences”? Please be accepting of those with differences. Today’s been a hard day for me. Jon and I have been discussing getting away as a couple. We need it. Desperately! Trying to sort out care for our children is hard. It brings up insecurities and hurts from the past; and while there are truths that I know, I struggle to move beyond the feelings. So many tears today. So many feelings. I watched a TedX talk today and while it was an incredible talk….it highlighted things that I stuff, in an effort to cope. There are stressors, as special needs parents, that we just can’t escape or lay down and walk away from. There are times when I feel capable to carry on. Other times, like today, I don’t know what to do. And the tears fall, uncontrollably. In an effort to pull myself back together and because we are supposed to be going out tonight (to connect with other parents of ASD kids), I do my hair and put my make-up on. I layer on cover up, foundation and powder, in a effort to combat the destruction of a day of tears. I paint on my best smokey eye and in whispers, threaten myself to not mess it up…..as if sheer willpower alone, could hold the tears inside. I curl my hair and back-comb it into submission. It’s something I can control, in this uncontrollable chaos that is my life. I spray on layer after layer of hairspray creating a shell, a protective layer of armor. Creating the illusion of beauty on top of a layer of brokenness. Illusions of beauty layered on brokenness. Imagine that you are a child, standing on the edge of a cliff. You look up and on the other side of a deep gorge is another cliff. You look over to the side and there is a rickety looking string bridge. You aren’t certain of its ability to carry you safely across to the other side, and so you refuse to move. All your friends are on the other side and it looks like they might be having a lot of fun. But you refuse! You aren’t really sure how everyone got over there, but that bridge looks unsafe and safety wins out over fun, every time. You decide that you are not going ANYWHERE. People suggest that you come over to the other side. You want to but……….refuse! They tell you that you have to come over. You really aren’t sure if it’s safe…….so you continue to refuse. Voices get louder, more commanding and more demanding. You continue to dig your heels in and refuse to comply. The harder they pull, the harder you pull…..just trying to remain safe. All of the sudden you realize that people are pulling and forcing you towards the bridge. You start to thrash and flail. You do anything to protect yourself from the uncertainty of what’s before you. In a blind panic, and completely incapable of rational and reasonable thought, you bolt. You run. Or conversely, you curl into a ball and cram yourself into the smallest corner available, so that no one will be able to force you into, what you are sure is, an unsafe situation. How many times have we asked a child to do something and then been frustrated when the situation devolves into anger, defiance, rage or physicality? You don’t really understand because what you’re requesting is not something weird or terrifying. It seems a pretty simple request and yet……..the child is labelled oppositional, non compliant or defiant. I hate those three words. Very rarely are those accurate adjectives to apply to a child. I believe that we need to approach children from the viewpoint that they WANT to please and they WANT to succeed. If behaviours arise that appear contrary to them pleasing and succeeding, WE NEED TO PAUSE. Why this this child feeling anxious? Why is this child feeling insecure? Why is this child feeling less than capable? What is feeling overwhelming to them? What information are they missing or unsure of? Going back to our picture at the top of the post…. Here is a different view of that situation. You are, a child, standing alone on one side of the cliff. You are aware that you are missing out on what seems like fun on the other side. You feel alone, anxious and unsure. You are desperate to feel accepted and safe; and while you wish you could go over, safety wins over fun, every time. You realize that someone is calling your name. They crouch down beside you and ask if you’d like to join the rest of the class on the other side. You aren’t sure how to answer because you are scared. They start to explain what the rest of the kids are doing and it sounds SO fun. It’s too bad that the bridge is the only way over. They explain how the bridge was made and how many pounds it can carry; and that makes you feel a bit better but you’re still not sure you can believe them. They call another kid over, who crosses that scary bridge, and together they show you how two people can cross the bridge. You are still unsure. They tell you that it’s okay and that they will stay with you on this side. That makes you feel a bit better. They share a time when they felt scared and uncertain. You want to join your classmates but you really aren’t sure. You realize that the person isn’t going to force you but will stay with you and that makes you feel a little bit safer and a little bit stronger. You eventually agree to try to cross the bridge even though you still feel scared. It might take you longer, but with acceptance and relationship you can accomplish amazing things. Instead of calling for the child to take action and then labeling them as non-compliant, what if we made the effort to understand and accept? What if we stopped pulling on the children, which is only increasing their anxiety? What if we didn’t “pick up the rope” in the first place? What if we joined them, and validated their feelings and emotions without having to fix or change them? What if we made sure they knew and understood the facts and information? What if we found out what they were fearful of? What if we explained how the bridge was made and why it is, in fact, safe to cross? What if we explained exactly what was happening on the other side? What if we told the child that we would cross with them? What if we gave them the power to make the decision and until they did, we sat with them and gave them the opportunity to feel safe and accepted? What if we built relationship instead of building conflict, opposition and disconnection? What if we allowed the time and space for a child to feel safe? I believe that this scenario plays out, at some point, with all children but that it’s especially true for children with anxiety, special/high needs and neuro-diversities. It’s important to recognize that the majority of opposition and non-compliance stems from anxiety and insecurity. ; and that we have the ability to make a difference in the way we view and approach children. We need to look beyond the bravado and indignancies of anxiety and insecurities; and see the cries for help. We need to build trust and relationship instead of building conflict and disconnection. We need to join with them, where they are at; and when we have built a solid relationship founded on trust, we will go so much further than we, or they, could dream or imagine. Don’t pick up the rope! I’m wanting to put this down here so that I can just walk away from it over the next 2 weeks. It’s not that anything HORRIBLE happened but it seems to me that it’s a lack of knowledge…..or, it could be that everyone was tired and emotional. But my responsibilities lie with the little one in my charge and I have the honor of standing up for him until he can stand for himself. My biggest issue with what happened yesterday is the misunderstanding of what was really going on. Children want to please, they want to succeed and so often their “negative” or “inappropriate” behaviours are a result of their insecurities and anxieties over a situation that they can’t figure out, control or succeed at. If our first response was not one of frustration or assumed disrespect, I believe that so many tense situations with our kids could be dissipated before the kids got stuck in fight or flight mode. Siah was sad and overwhelmed and running away from those feelings and emotions. The harder people tried to force him to face those feelings, on his own…..the harder he dug his heels in. The moment that I joined him, in his feelings, and helped him to carry and process those feelings is the very moment that his defences started to come down. This is not something that is solely applicable to Siah….this works for every child. Believe that children want to succeed. Believe that children want to please. Know that something else is going on, if they are acting contrary to those two beliefs. I have found that this works almost 100% of the time to dissolve anger and anxiety. It’s almost impossible to work through anything or to teach a child when they are in fight/flight mode. And anxiety in children often presents as anger. Anger is usually a secondary emotion to fear or sadness and usually presents when a child is feeling out of control. Empathy and empowerment are two of the most critical tools when working with children, in my opinion. As adults, it’s our responsibility to work with the children and to adjust to their needs and deficits while continuing to teach and encourage in those areas of deficit. They are the vulnerable and needy. We need to put their needs first. I believe that there may have been a personal desire to be in the assembly which may have prompted personal feelings of anxiety for missing a special event. But…..if the focus had been on why Siah was struggling and not on “just getting him back to the assembly”….the entire situation could have gone down very differently. Think of a tug of war over a canyon….with the child on one side and an adult on the other….the canyon is the event or idea that is causing the anxiety…..the harder the adult pulls the child, the harder the child will pull back trying to remain in a place of safety. They will quickly lose all ability to reason and rationalize as they struggle to find a place of safety. If the rope is laid down and the adult crosses over to the child, they can stand together on the edge of the cliff and talk about the issue without the fear of being pulled into it. Once the adult lays the rope down, there is nothing for the child to be struggling against. They may be SO terrified that they don’t realize the rope has been laid down and it may take a moment to help calm them enough to see that……but it’s SO MUCH easier to do that beside them, then across the canyon. In the middle of his stress and anxiety and internal chaos……he’s still looking for the silver linings. I love that. Our children will struggle – that’s a given – and some more than others, but it’s our job to stand beside them and to help guide them through, until they are strong enough and confident enough to do it on their own. It’s a privilege and honor to be able to be there for them, especially the more vulnerable ones. I’d love to hear your thoughts on this…..not necessarily Siah’s particular situation but this idea…..this idea that children inherently want to please and that we can help or hinder the situation with our actions and reactions. Is this a foreign concept to you? I’d challenge you to try it then next time you come up against a child who seems defiant…..it will blow your mind! I’m SO ready for this break. Not that it’s really a break…..what with kids home from school and then this little thing called Christmas. But this fall has been a busy one and it’s not been easy. I’m ready to jus step off the crazy train for a moment and just BE with my family. Today was a tough day for Siah. 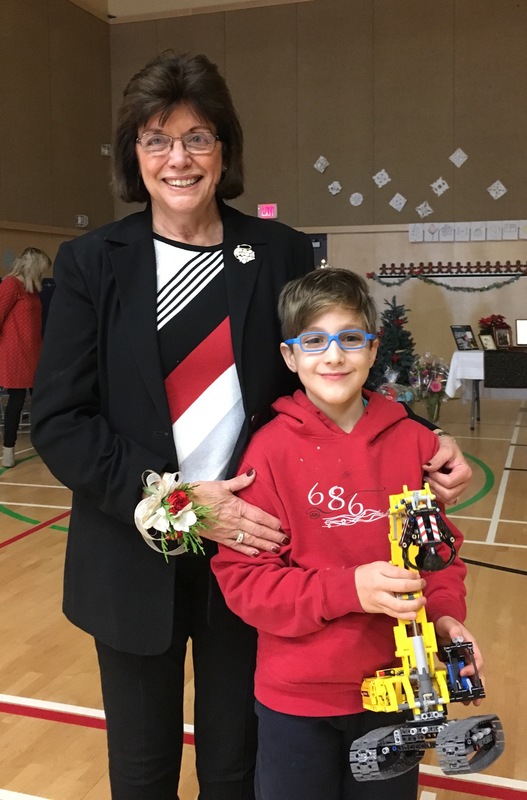 Any day that’s off schedule and out of the norm is tough, but this last week of school before winter break has been one filled with assemblies and parties and treats and crafts and singing….. While that sounds fun, for Josiah, it’s overwhelming. To make it even worse, his Principal is retiring and today was her last day. He LOVES her and in a lot of ways, she has been his lifeline at the school. While teachers, friends and classrooms changed, she was always there…..caring for, championing and encouraging him. He’s mentioned a few things that have made me wonder how much anxiety he was carrying over her retiring, but I think he’s internalized a lot more than he’s let on. I’ve brought it up a number of times, to remind him and to allow for opportunity to process. He understands from a conscious level but I think that he’s been struggling to process the feelings and emotions. There was an incident at school today and I don’t have all the facts, but I heard another student looking for “Siah’s mom” and when I left the assembly to see why I was needed. I was informed that they were just going to try and call me because Siah was very upset. I found him in the stairwell, clutching the Lego creation that he associates with his Principal and acting quite belligerent. I was almost 100% certain that his actions were entirel because he was overwhelmed with feeling and emotion and unable to process those feelings without help. He was refusing to go back to the assembly and quite upset that people were “forcing him” to go back. The part in all this that’s so tough for me, is that this is a little boy who doesn’t quite understand or speak the same social/emotional language that the rest of us Neurotyoical People do. He looks like he should and some times, he knows enough to fake it…..but really, he’s lost and has no clue. So here he is and he’s run headfirst into an extreme emotional scenario (a retirement assembly) but add into that, that he feels devastated that she’s leaving and terrified of what the new year/new principal will bring. Now demand that that child, who doesn’t understand the language, his feelings or the situation……demand that he face his fear and do it NOw, in the language that he doesn’t understand. He says that someone told him they were really disappointed with him. That is brutal for a parent to hear. I don’t know that’s exactly what someone said or if it was inferred. What I do know is that what Siah received and he felt shamed because of it. When I found him in the stairwell, he was so on edge and definitely in fight/flight mode. He was refusing to go back to the assembly and I knew that there was a bigger issue. He’s been walking around our house singing “what a wonderful world” for the past 2 weeks….and commenting about how it’s the principals favourite song and that they were going to sing it for her. I tried to see if he would come with me but no dice. Then I asked him if he was sad and feeling upset because the principal was leaving. At that point, tears started to run down his cheeks. I asked if I could give him a hug and he put aside the Lego and allowed me to comfort him while the tears fell. I tried to convince him to come back to the assembly but he was scared and refused. I told him we could sit in the office but when we got there, it was locked. So I suggested we sit in the hallway. He agreed to that. I pulled him into my lap and talked to him a bit more about how this moment would never come again and that he would be so sad if he couldn’t sing the special song. We heard them start the song and he agreed to come inside the gym, while holding my hand, if I stood with him. So we sang with the rest of the students. I let him keep the Lego creation. The main issues in my mind were calming him down, haveing him be apart of this very special celebration and recognizing & understanding his emotions while acknowledging that it was ok to feel sad and overwhelmed. He told me that he was told he couldn’t have the Lego as fidget and while I understand that it’s neither discrete nor small……it’s definitely tied into today’s bigger issues. I may come back and post some more about this more tomorrow but for tonight, I’m going to head to sleep because I’m falling asleep on my phone.